* He/she can be found working inside many of Australia's businesses and corporations. 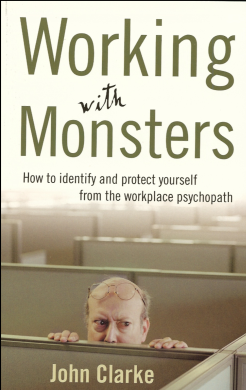 Workplace psychopaths exist in a variety of workplaces. They are individuals who manipulate their way through life and leave an indelible mark on both their victims and society. They are destructive men and women - cunning, self-centered, ruthless and terrifying. They make working life a living hell for many of us. What motivates these individuals? How can you protect yourself from these 'monsters' who hide behind a veneer of respectability? Don't be a victim - be wise to their tricks!